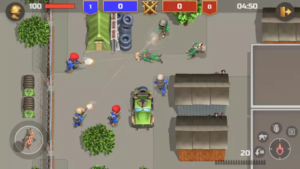 Everyone loves to play online multiplayer shooting games on android because of intense action multiplayer gameplay in which you shoot down other players with your weapons. But many multiplayer shooting games do not support low-end devices like MADFINGER’s Shadowgun legends. 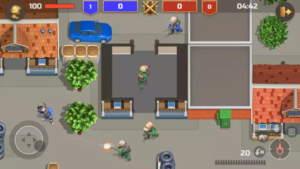 Max Shooting is a new multiplayer shooting game, optimized for low-end devices. It’s easy to play this game, you just type your nickname, choose the server or game mode and start playing. You can play “Deathmatch” and “Team Deathmatch” in this game. Under deathmatch mode, your goal is to shoot down maximum players. There is a fixed timing, player who slay down maximum numbers of players at the end will get top position. Under “Team Deathmatch”, You play with some random players against another team and your goal is to slay down opposing team’s players. Score – You will earn 1 point if you shoot down 1 enemy. 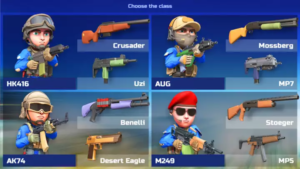 Each class has different guns – Uzi, Crusader or Benelli, Desert Eagle or MP7, Mossberg, and Stoeger, MPS. Gameplay – After choosing the class, you will enter into the battleground where you have to shoot down opponents. 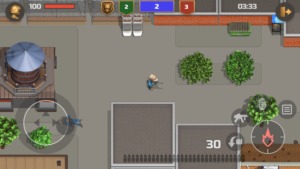 You have two guns – you can switch to anyone anytime, Grenade is also available but in limited figures. Just shoot down other players with your gun and bomb and get the first spot at the end. As mentioned above, there is a time limit for each battle – you can leave anytime, join anytime. Health – If someone shoots you, health will be reduced or you will start again with full health. Two types of statistics are highlighted – deaths and kill. You have to increase figures of kill section by shooting down other players and reduce no. of deaths by avoiding enemies’ bullets/bombs. Max shooting game is really a great multiplayer shooting game. You can increase no. of players to 12 in deathmatches by paying some bucks or continue playing free with up to 7 players. Thanks!! for visiting us. Don’t forget to check⇒Top new Android games.